2 Bedroom Detached Bungalow For Sale in Norwich for Offers in excess of £290,000. 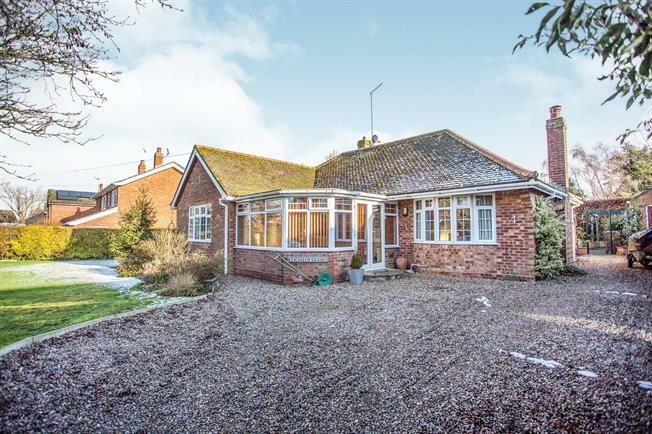 A lovely detached bungalow on a generous sized plot offering entrance sun room, hall, sitting room, dining room, kitchen and garden room. Two bedrooms, master with en suite, family bathroom and simply nothing to do. The gardens are both well kept and this home offers lots of parking and a garage. Garden shed and workshop. This property is well worth viewing. Sealed unit double glazed window to the front and side overlooking the garden. Sealed unit double glazed double doors to the side. Under floor heating and tiled. Door to hall. Built in airing cupboard, loft access, doors to sitting room, dining room, bedrooms and bathroom. Radiator. Sealed unit double glazed bow window to the front over looking the garden, radiator, living flame gas fire to attractive fireplace . Double doors to garden room and opening through to the dining room. Door to hall and opening to the extended kitchen. Radiator. Sealed unit double glazed windows to the rear over looking the garden. Range of base and wall mounted units with two sinks, built in gas hob and oven with cooker hood and extractor fan.. Tiled splash backs and wood effect laminated floor. Door to the garden room. Sealed unit double glazed windows to rear and side over looking the garden. Double doors to the sitting room. Sealed unit double glazed door out to the garden. Sealed unit double glazed window to the front, built in wardrobe, radiator, door to the ensuite. Double shower cubicle, wc and wash hand basin, tiled splash backs, coved. Sealed unit double glazed window to the side, radiator, built in wardrobes. Sealed unit double glazed windows to the side, panel bath, vanity wash hand basin, wc, radiator, extractor fan. Splash backs. Fitted storage cupboards and laundry basket. Walled entrance to the driveway leading down to the garage and generous amount of parking. Mature garden, lawned with inset tree and borders with hedging. The rear garden is mainly laid to lawn with patio area, mature borders with further lawned garden to the side, with greenhouse, shed and workshop to remain. This property is well worth viewing. Double doors to the front of the building giving storage area, door to the rear of the garage which is used as a study, but is easily converted back to a traditional garage.